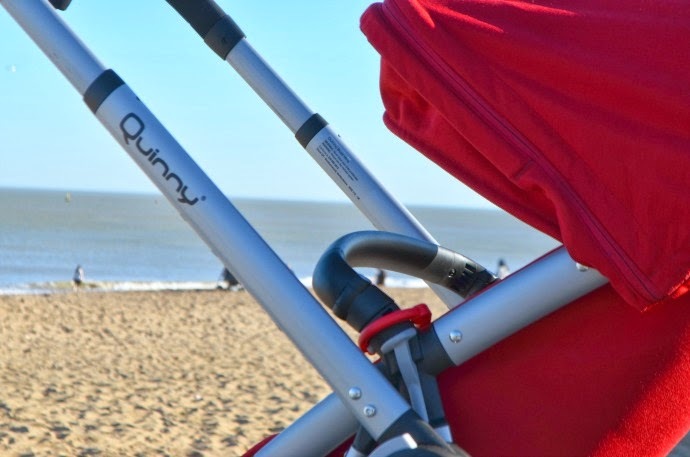 The Quinny Buzz Xtra is the next generation from the original Buzz and features a few changes. The basket is bigger, the front wheel is better on different terrains and the hood extends even furthur than before. 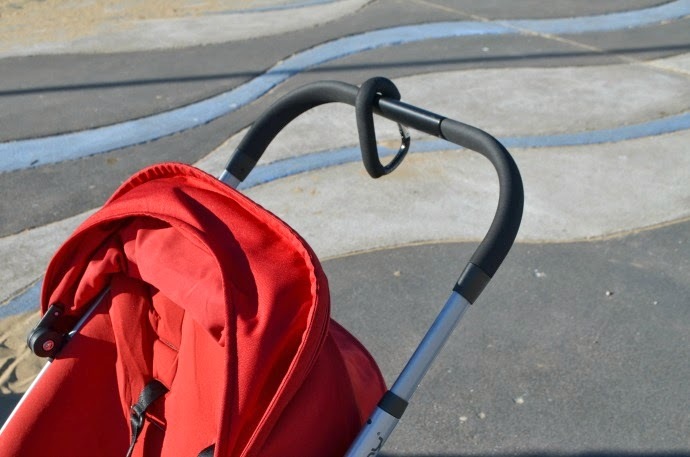 The pushchair comes in three colours, and I love the vibrant red of ours. 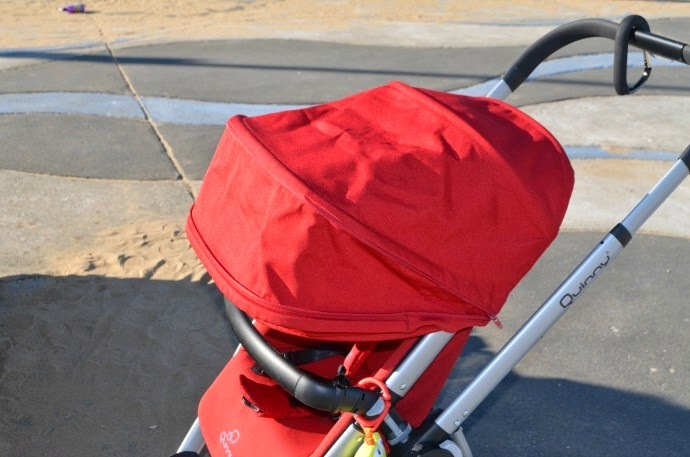 The seat unit is very well padded and the material is easy to keep clean and very soft. The seat is moulded around the child and both boys seemed comfortable in there. There is a five point harness which was easy to adjust and the bar opens from either side making it easy to get the child in and out. The hood extends really far, blocking out everything if you want which is perfect for nap times. The hood can be moved up and down to accomodate a bigger child which was great with the considerable height difference between Dylan and Archie. I did find that Dylan looked too big in the seat, but he is an incredibly tall 2.5 year old and closer in size to a 3.5 year old. 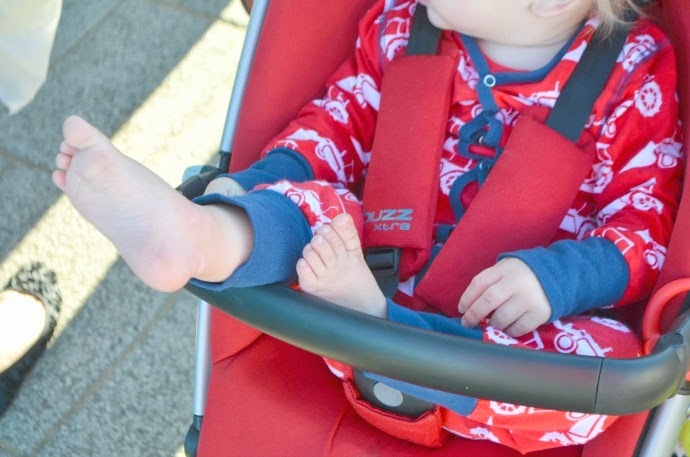 The foot rest can be moved, so that an older child has their feet down whilst a younger one can keep them up, and there are several recline options. With the seat in parent facing mode, there are two recline options and in forward facing mode there are three. It is only in forward facing mode that the child can sit completely upright, which is how both of mine prefer to be. The upright position is completely straight though which is great as I know as mine have gotten older, they find that the most comfortable. The seat unit is easy to switch and recline, and the same buttons do both jobs. The handlebar is height adjustable and easily altered by a button and I found the top height very comfortable at 5 foot 9, as did the bloke at 6ft. The basket is improved from the last Buzz but it still unfortunately, is my least favourite part of the pushchair. Because of the design, the bar goes straight through it, making it difficult to put anything substantial in there, especially with a raincover as well. I can't fit a nappy bag underneath which can be a pain as I don't like hanging them on the handles if I can avoid it. 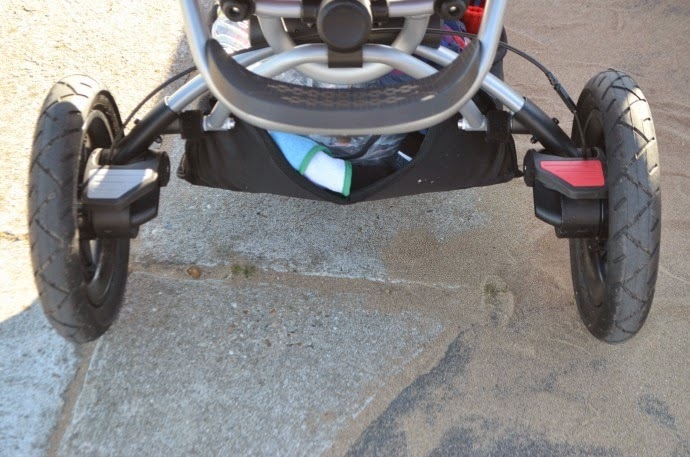 This is unavoidable, and the pushchair looks great as it is, but I don't find it as practical. That said, if you carry lots of little bags, or use your basket more for blankets and jackets then it is easy to use and quite spacious. 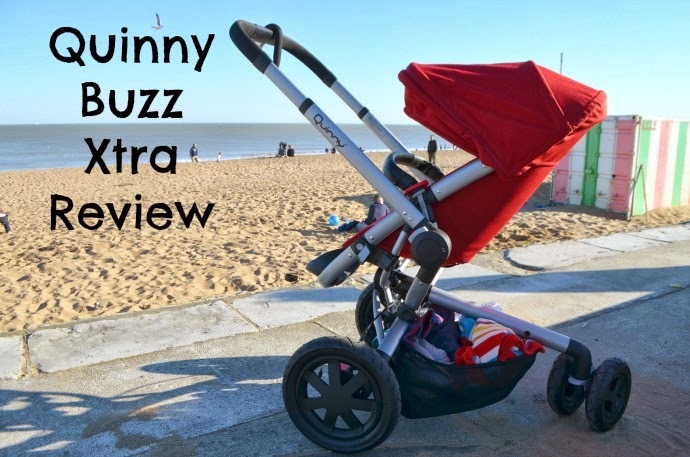 The Quinny Buzz Xtra is easy and light to push and I have had no problems at all with the steering or wheels. 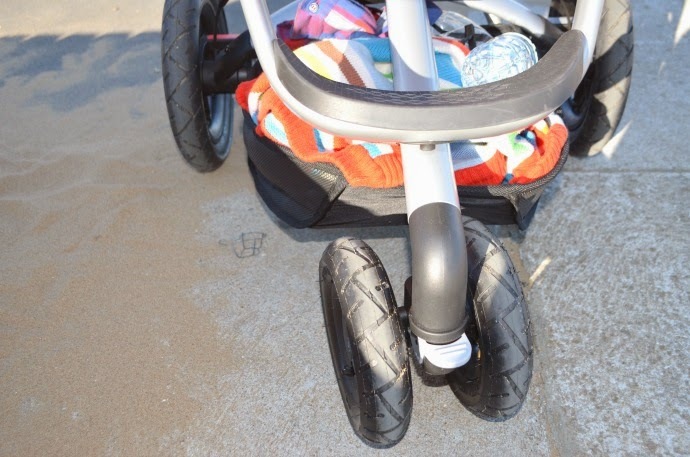 I have used the pushchair on public transport, around shopping centres, on the pavements and in the park and I have found the wheels to be great all terrain. Having spoken to a friend who had the older model, she agrees that there is a great improvement here. 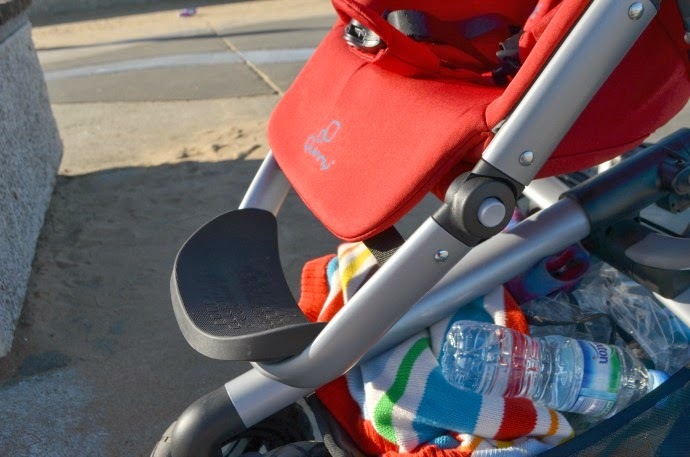 The Quinny Buzz Xtra is easy to collapse, although a little force is needed, and to open it, you just release the catch, and it does the rest automatically which is so easy and convenient if you are folding it often. Overall, I really like this pushchair. It is lovely to push, it stands out with it's smooth design and lovely colour and the boys seemed very comfortable in there. 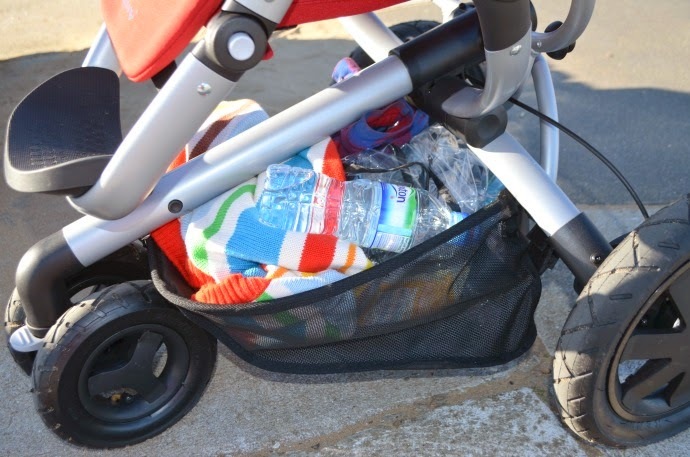 The only real problem I have is with the basket but that is unavoidable with the pushchair design and it hasn't stopped me using the pushchair. I must say the new Quinnys are the 1st I have ever thought look nice. 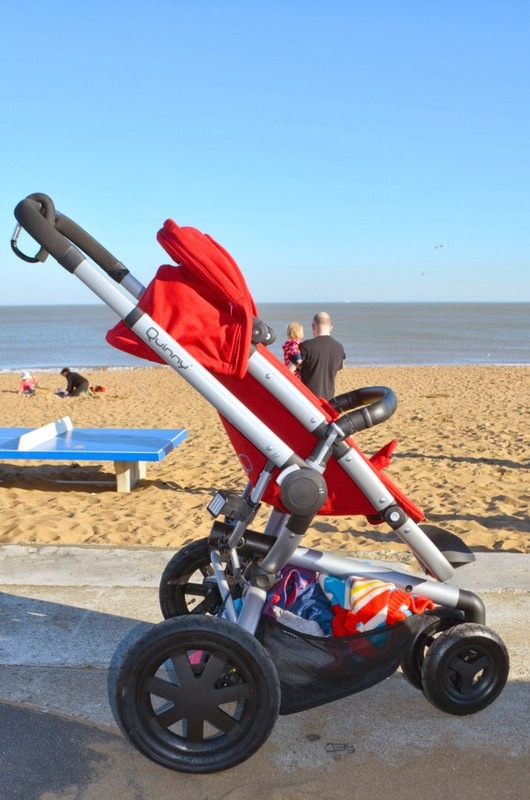 The Quinny Buzz Xtra can be folded with the seat unit attached (as can the original Buzz) It must be world facing and upright position in order to fold with seat unit attached. Do you know if the extended sun canopy fits on the older Buzz 3 model? I love the idea of having the extra sun protection - so I'm wondering if I can buy that part and fix it on my Buzz 3.